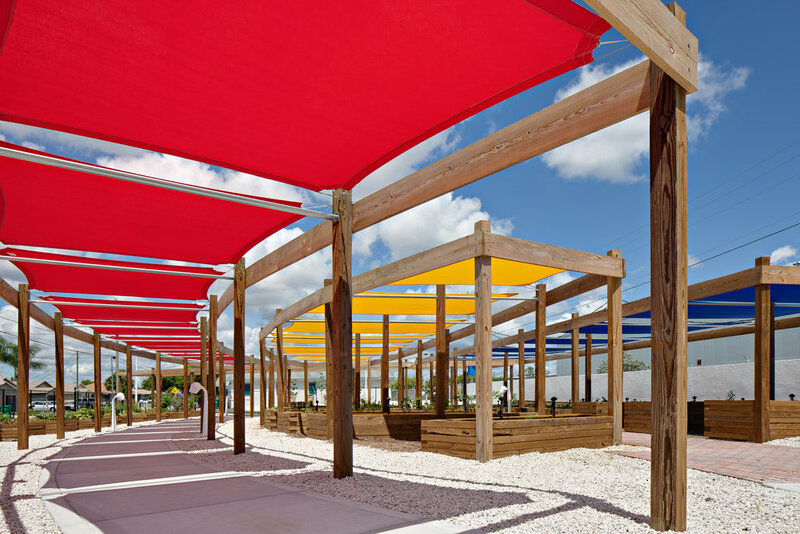 Riviera Beach Heights Community Garden — Song + Associates, Inc. The community garden was developed on a vacant parcel of land that separates the residential community from neighboring commercial uses creating a natural buffer and much needed park space. The community garden, open to all, provides food to local church organizations and food banks. Children from nearby schools are brought to the garden to learn about horticulture and sustainable practices for growing plants and vegetables, by utilizing the rainwater irrigation system. 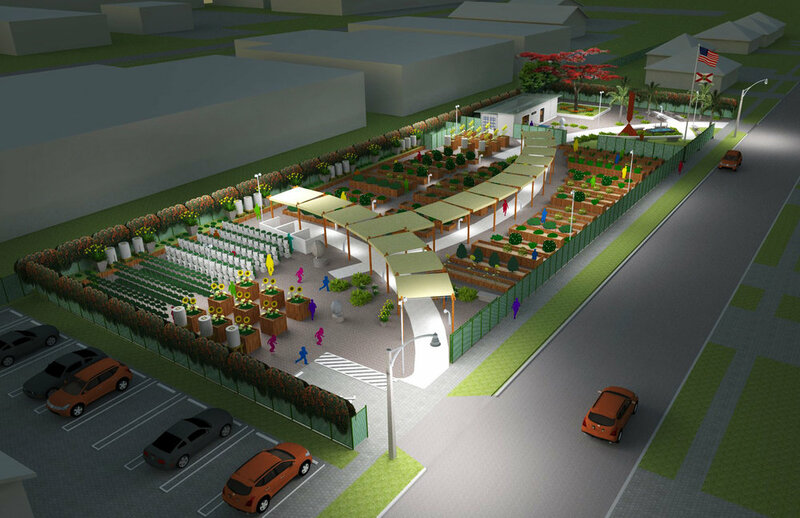 The design includes cisterns for rainwater collection, covered trellis walkways that provide shade, and a small plaza to accommodate community gatherings and green markets. In addition, Song + Associates refurbished a donated shipping container to serve as the garden’s tool shed as well as a public restroom. 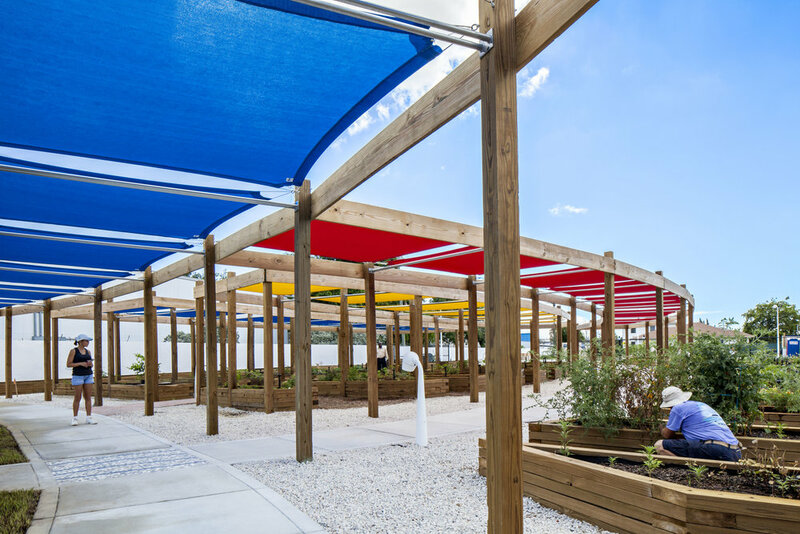 Song + Associates was also hired by the Riviera Beach Community Redevelopment Association (CRA) to design a linear park in the Riviera Beach Heights neighborhood to include new concrete sidewalks with inlaid tile mosaics, new landscaping, security cameras, and lighting. This half acre site is located just south of the Community Garden. Both the Linear Park and Community Garden projects were apart of the CRA’s request to complete a master plan with strategies for immediate and future implementation. The project proposed plans to define and connect neighborhoods to improve community cohesiveness and encourage sustainable economic development. The project includes way finding signs design, street scape, zoning, traffic calming, maintenance and monitoring programs, and community gardens and parks within the CRA. Song + Associates has also worked closely with the Riviera Beach Police Department to employ leading edge crime prevention technology.